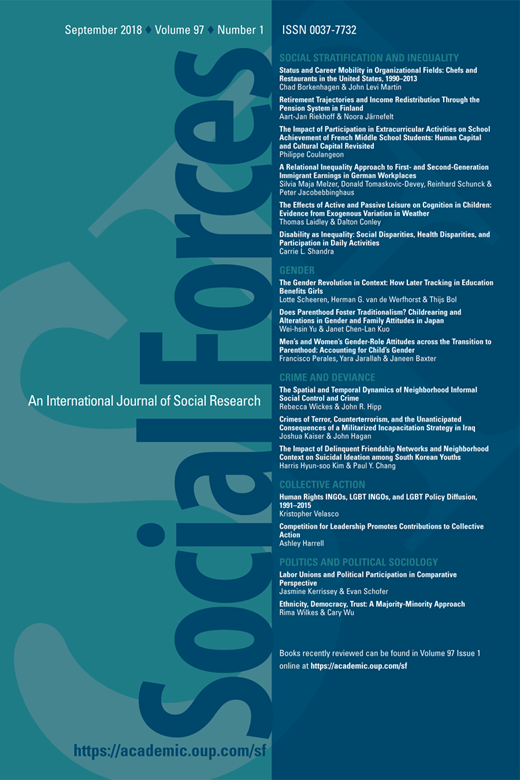 New publication by Ruud Wouters in Social Forces, titled “The Persuasive Power of Protest. How Protest wins Public Support”. Click here for article. Abstract: How do protest actions succeed in winning public support? In this paper, I theorize how features of protest can persuade citizens to support demonstrators. In particular, I argue that broadcasting an attractive collective identity by means of diverse, worthy, united, numerous and committed participants (dWUNC) triggers supportive reactions of observers through increasing identification with protesters. I test this argument by exposing respondents to manipulated television news items of a protest event in two video vignette experiments. Study 1 scrutinizes the effect of dWUNC displays in an asylum seeker demonstration on a sample of Belgian citizens. Study 2 replicates this design in the US for the Black Lives Matter issue of police brutality. Both studies show predispositions of citizens to strongly affect favorability towards protesters. On top of these potent receiver effects, however, also the dWUNC features prove persuasive. In both experiments, a consistent pattern of feature effects is found: demonstrations that mobilized more diverse participants, who behaved worthy and acted in unison, elicited more supportive reactions. Study 2 adds that these protest feature effects are in part mediated by increasing identification with the demonstrators. The heterogeneity of protest feature effects is explored.